Browse: Home / 2009 / August / 17 / Looking forward to 2010? Are you the kind of person who likes to plan ahead? And I mean really, really ahead? Like, nearly 365 days ahead? Of course, the speculation is running rampant already over who the headliners are. I don’t know that you can even make a prediction like that, given the nature of the music industry today. I’m sure several of the headliners will be epically overrated bands and one or two will be Old Bands That Never Go Away. Call it a hunch. 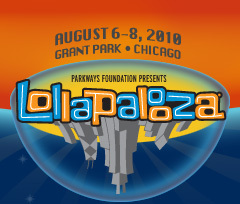 While I’m here, though, let me say how much it pleases me that Lollapalooza doesn’t use Ticketmaster (or LiveNation) for their sales. The fact that I don’t have to pay for any service fees, and that I can print my ticket for free instead of having to pay to have Ticketmaster make me a PDF or something… that makes my little heart glad. I’m okay with little fees, like the $2 that Schubas tacks on to tickets. But I paid $16 in fees on a $29 ticket the other day from Ticketmaster –that’s 55% of the ticket price. I would understand convenience fees more if there was an alternative to purchasing online, but with so many venues closing down box offices and moving almost exclusively to online sales, I can’t help but feel incredibly ripped off. Anyhow, off topic rant aside, cave in to the pressure and pick up your tickets here, while they last.